In my final post about Born Pretty I'm going to show you this sparkly eye-shadow trio. When this little palette of metallic shimmer dropped through my letter box I was sooo pleased! I've been wanting to upgrade my eye-shadow for ages now and these have done just the trick! With the Christmas season upon us, sparkly-shimmery eye-shadow is just what we need to finish off our party make-up to a tee! I love how these three all compliment each other, so if you're handy on the make-up front it would be great to play around with blending them into each other for maximum effect. The first one shown (sorry not the best photo) is a very dark charcoal colour, almost black with silver shimmer running through it. The next is a gorgeous bronze, but this time with a golden shimmer. Then finally, a very subtle silver, again with a shimmer going through it. They are all so lovely on their own, using one colour at a time will keep your look subtle and also a great way to introduce a little bit of sparkle into your day time look! 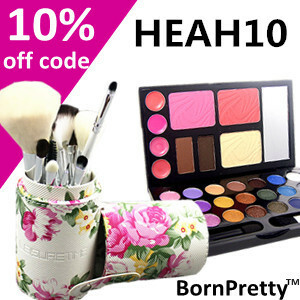 Check out this gorgeous eye-shadow palette here and use the code HEAH10 to get yourself 10% off!! Ooh sparkle! I have to say I'm not an eyeshadow girl really, must wear it once or twice a year :0 but I can see this would be a great palette for all the Christmas festivities !